Promising teenage centre-back Perr Schuurs spoke to other clubs before deciding to sign a contract with the Dutch giants. 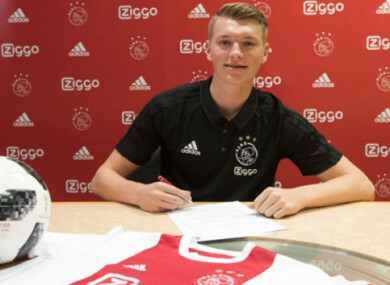 Perr Schuurs has joined Ajax. AJAX HAVE SNAPPED up teenager Perr Schuurs from Fortuna Sittard following reported interest from Liverpool and Tottenham. Talented centre-back Schuurs has agreed a four-and-a-half-year contract at the Amsterdam ArenA, but will be loaned back to second-tier side Fortuna for the remainder of the season, when the deal goes through on 1 January. The defender was named captain of Fortuna ahead of the 2017-18 season, at just 17 years of age, having impressed in his debut campaign with the first team. Schuurs had been touted as a candidate to strengthen Liverpool’s under-fire defence, while also being linked with the Reds’ Premier League rivals Tottenham, but he felt Ajax was the right fit despite talking to other suitors. It is a dream to be able to play at a top club like Ajax,” he said in a statement on Fortuna’s official website. Ajax director of football Marc Overmars said: “He knows what is required of him to be able to reach the top. The fact that he is already captain at Fortuna Sittard at this young age also says something about his personality. It is already being suggested that Schuurs could be a long-term successor at Ajax for Matthijs de Ligt, with the 18-year-old centre-half being heavily linked with a switch to La Liga giants Barcelona. Ajax have also announced the signing of Boureima Hassane Bande from Mechelen this week. Email “Ajax snap up rumoured Liverpool and Tottenham target”. Feedback on “Ajax snap up rumoured Liverpool and Tottenham target”.